Out of all fairness to Genesis, our 2018 G80 test vehicle shows 11,000 miles on the odometer. It’s been driven. And frankly, this review could be titled “Used Genesis G80 holds up well under abuse,” knowing that this ultimate sport sedan has been beaten and abused by the press corp.
2018 Genesis G80 AWD 3.3 T Sport lives up to the performance hype and more. I’m one of those automotive review guys that treats his loaner as if he owns it; not so much for my compadres. Hand a young journalist the key fob to a high performance car or light truck of any variant, and most likely, the subject will be treated with less than Kid gloves. Such is the case with our 2018 Genesis G80 Sport AWD-- abused, but nonetheless, remains as “tight” as new. Equipped with Hyundai’s best rated, high output twin turbocharged V6 gasoline engine, the 365 Horsepower 3.3 L GDI twin turbocharged V6 injects a bit of lightning beneath the hood of G80 Sport, and achieves Zero to 60 MPH sprint speeds of 5 seconds -- enough “sport” to get any driver into trouble with Johnny Law. However, for those of you looking for exceptional fuel economy from your next premium sedan, read no further. During our week long review of Genesis G80, we averaged no more than 19.2 MPG in mixed weather and road driving conditions. And, recorded 16 MPG while transitioning city streets. We found G80 to be fuel thirsty under real world driving conditions. However, G80 has a split personality: I like Hyundai's midsize premium performance sedan for its comfortable and quiet interior confines, as well as its unique good looks. And yes, as equipped, our test ride features exceptional driver assist and accident prevention technology; including LKA, (lane keep assist) ADC,(adaptive cruise control) automatic emergency braking, back up sensors, blind-spot-detection, surround view back up Cam, and more. Also, the longest new car, and extended drivetrain warranty found in the segment. Frankly, I don’t require extreme high performance from my daily driver, but it’s nice to have it on tap when needed. 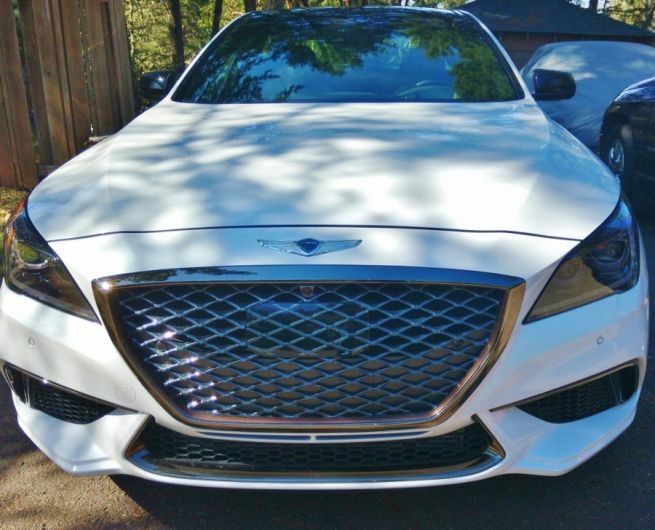 Thankfully, 2018 Genesis G80 Sport AWD presents a comfortable, well appointed leather trimmed interior, and is top of class in good looks, in a very recognizable Genesis genetics way. Our Genesis test ride turned the heads of all generations, as we drove through Western Oregon and beyond. The #1 looks grabber for Genesis is its in-your-face monster grill treatment, black-anodized contrasting trims, sensuous bodyline, and blackout 19 inch alloy rims, and high performance all-weather radial tires. We like the integration of head and tail lighting, as well as the functional fog lamp, and exhaust lower cowling designs. The Genesis design cue holds up well when compared to Mercedes Benz and Jaguar, and will do so for years to come. For Torque News, our Genesis comparison is limited to the G90 and G80 series, tested in two engine, and 2 drivetrain variants. The G80 is the smaller, more powerful of the two, when we opt out of the V8 option -- we’ve yet to experience one on the street. Torque transfer is Via a very good 8-speed automatic transmission with available wheel mounted paddle shift and drive mode select options. G80 offers two engines, and two drivetrain options: The base model, rear-wheel drive with the lower output 3.8 L V6 comes to market with an MSRP of $42,745 plus applicable dealer charges, tax, license, etc. Our fully optioned 2018 Genesis G80 3.3T AWD Sport hits the street with an MSRP of $58,725, placing it in the market company of some pretty heady competition. Is it worth the tab? Last Fall we spent some seat time behind the wheel of the 2017 Genesis G90 4 door luxury sedan. When looking to the total package, price point, available torque and horsepower, we declared G90 a substantial, measurable luxury-sport sedan purchase value. I’m not convinced that G80 meets the level of G90 in sport refinement. Let’s take a look. Read our G90 drive review here. 2018 G80 AWD 3.3T Sport takes on BMW, Mercedes and Jaguar. Yet, when we look to the Genesis build sheet we discover one, if not the most comprehensive premium sedan packages available in the midsize segment. You can read more about that here. There’s little debating the obvious. 2018 Genesis G80 Sport AWD is visually captivating. But does Genesis live up to the public relations hype from behind the wheel. Well yes, and no. Granted, while not the quickest 4-door executive sedan available in the segment, G80 will keep you on the Chiropractic adjustment table. Yet, were Genesis G80 excels in sprint-speed, instant on throttle response, it loses in high-speed handling, heavy-nosed-downhill braking, and overall “loose” track control. Don’t read me wrong: G80 is a fantastic Freeway long distance cruzer. Thanks to a power adjusted 16 position leather clad driver's seat, good positioning of instruments and controls, a top-notch audio system, climate control, and a backseat that doubles as a lounge chair, one would be hard pressed to beat G80 for highway comfort. However, despite the optioned Sport CDC suspension with intelligent drive mode, I found G80’s handling to be mushy at times, bouncy on occasion, and overall, less than impressive when being pushed past the century mark on two-lane country sweeps. But then again, we’re talking about a 2-ton car here. In the end it comes down to one question: What do you want from your executive sport sedan? Likes: Body design, interior trim, functionality and quiet, spot-on turbo-engine performance, wet weather road traction. Don’t like: Fuel efficiency, high speed overall handling, dated analog controls, exhaust tone(at certain speeds) direct inject engine rattle at idle, intermittent suspension tuning. Regardless, as with my friends at Car & Driver, I give Genesis G80 a strong 4 out of 5 rating for overall executive car packaging. It’s a good car that approaches perfect without ( much) compromise. I guess what rubs me a bit raw is the fuel efficiency. With today’s available engine and transmission technology, I can’t excuse it!